The other day, despite poor weather I went out for a walk, optimistically taking my sketching gear along……..but then, I’m never without it anyway. The morning became even drabber, the weather forecasters had really screwed this one up! However, we shouldn’t be too despondent as we can learn so much outdoors, even in the direst of weather. 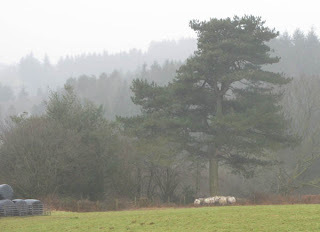 I suddenly came upon this view of a conifer wood, and marvelled at the simple moody beauty. Apart from the closer trees, all detail is lost in the atmosphere – here was a superb lesson on how to cope with massed trees in a painting, courtesy of Mother Nature herself. You can easily make out the various tones, getting stronger as the massed trees get closer, and it makes the rendering of them so much easier when approached this way. In a painting you would do best to lose some of those edges – perhaps have an intermittent edge on the rows of trees, as in fact you see in the middle line. This technique can be used in good weather as well, of course. I’ve been out again today in glorious sunshine and the same effect on massed trees was clearly visible when viewing them against the sun. Practice the method with your watercolours. If you have a large area of massed trees try to avoid putting in too many of the lines of trees, and often a half-line can be equally effective. These lessons are all around us, so keep your eyes open – you don’t even need a sketchbook!